"Why do you need so many radios?" The cerebral answer is, just as a photographer owns a collection of bodies and lenses, some radios are better suited for specific uses. The other, more realistic answer is it's my hobby; one that I am passionate about. "How many baseball cards do you need?" Same answer as radios: as many as you can collect, store and afford without getting thrown out of the house! There are hundreds of reviews regarding the radios I'm listing here. Although based on opinion, most are fairly accurate. Occasionally, however, you'll see a review that comes from outrageous expectations or a lack of knowledge. I'll base my thoughts on performance accounting for the following criteria: cost, size and intended use. You can't compare a $30 radio with one that costs $200. But if I plunk down 30 dollars, I want that radio to perform like $30. In most cases I own or have used more than one model and they have been tested in areas as diverse as midtown Manhattan to rural farmland. I'll also mention that I prefer listening through the onboard speaker than headphones; one of the reasons my hearing is still intact. These are my opinions, yours are always welcome. This is the radio that replaced the YB-400 (G4000). The question is, was this an improvement? The short answer is yes. If portability means "smaller," the G5 is 3/4 the size and weight of the YB-400 and makes vast improvements in functionality. FM selectivity is superb and MW is as solid as it was on the 400. Aside from the smaller size, the biggest improvement is the tuning wheel and alarm section. 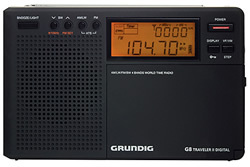 Eton just recently introduced the Grundig G3, which is a G5 updated with Synchronized detection, FM RDS and the Aircraft band. A comparison of the two can be found here. AM/MW: Grade A (equal sens from 540 to 1700) some noise on certain frequencies. Pros: Great all-around performance. 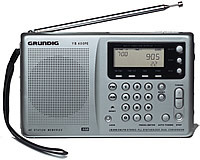 This radio pulls in stations and does a good job with adjacent stations in the crowded Northeast USA. Smooth tuning knob works well, especially on SW. 700 memories divided into 100 pages. Excellent features, including 4 alarms that will allow you to select station, loudness, length of playing time and days of the week to set. Three scanning methods. Will charge batteries, well-lighted dial and buttons. Really nice sound when holding in hands. Decent battery performance. Cons: Mostly minor stuff: I'm getting used to push-button volume, but this radio is too harsh between steps. When 6 is too low, 7 will be too loud. Battery indicatory is weak and sometimes the radio will function oddly before the indicator tells you to change the batteries. (Rechargeable batteries work best in this unit.) Speaker occasionally seems to loose bass response when set on table. Memory recall isn't user-friendly. Must be set to "page' and then you only have access to 7 memories at a time. Best Uses: Great all around radio and one of the best performers out there. If you could only take one portable, this would be a first choice. Start with all of the features mentioned in the G5, shrink it down to half the size and you have a good idea of what the G6 can do. This is an amazing radio for its size. Slightly less sensitive than the G5 on FM, but strong MW and SW performance might have some people think it's just as good. In some ways, it may be too sensitive as it can overload and there is no "local" switch. Pros: Want G5 performance in half the size and $50 less? Here you go. Speaker sounds great for the size. This radio pushes the envelope for "all-around usability." Cons: In certain locations, this radio can be too sensitive. Lacks "Local/DX" switch. Push button volume has greater range than the G5, but the amp is more suited for the speaker than headphones. You'll hit distortion on headphones before "Paint It Black" is loud enough. Memory recall worse than G5. Push too strong and you'll reset the memory. Here is an inexpensive unit that features DSP (Digital Signal Processing) which allows for incredible selectivity. Simply put, this radio is the best FM performer, period. I can cleanly receive a distant 95.9 between Class B 95.7 and local 96.1. On the G5, 96.1 splatters over. While taking the LIRR through Queens, this little wonder keeps all the adjacent pirates at bay. And I can receive WDRC-FM 102.9 on the train in B103.1's backyard. Amazing. It's a much different set-up than previous digital models, but it features a friendly user-interface that some may find more fun to use. A tuning and volume knob replace buttons, but this unit is fully digital. G5 and G6 give somewhat better sound from the speaker, but this radio can stand on its own. What really sold me on this radio were certain features and surprises I wasn't expecting at this price. 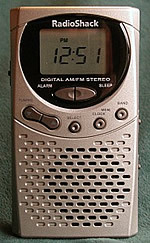 Usually when you set the alarm to wake you up to the radio, it turns on at the previous volume you had going to sleep. It's one of the reasons a buzzer was important to the YB-400 and missed on the YB-550. (The G6 & 5 allow to actually program the volume, station and duration of what you wake up to). The G8 automatically raises the volume when it turns on and flashes the time on the screen. You can also program how long you want it to play. Neat stuff for fifty bucks. Pros: Digital tuning makes this the best portable FM receiver out there. MW is on par with the G5 and G6. (AGC does make it seem quieter as you scan the dial.) A great interface that includes tuning and volume knobs (all-digital) that adjust to the speed that you turn them. Takes a moment to get used to, but a great feature. I don't really miss the push-buttons because of very user-friendly memory tuning. (Memories are divided at 100 each for MW and FM, 200 for SW.) Decent sound from speaker and headphones. Three AA batteries last a long time. Display gives you home/world time, signal db / signal to noise ratio and the temperature. (Pure geek stuff here.) The world-time knob behind the front panel is fairly useless (unless you're a "world-traveller"), but it provides a good reference point on the world time zones. Cons: It's really hard to be picky at the $50 price point and despite usually finding "something" I would do differently in most radios, I haven't found one with this unit. OK, you can't disable the dial light completely, so I hope it lasts the life of the radio. The button beeps (set "on" by default) are horrendously loud and useless, but can be disabled by holding down the snooze/light button for a few seconds. But, for the first time since the G4000, you can choose to set the alarm to "beeps." The supplied pouch is not as nice as what is normally provided with Grundig offerings nor is there a wall-wart included, but I have to consider the price of just $50. I will complain that the ONLY place you can find the AC adapter is through the Eton webiste, and it's the most expensive one out of all. Can you say "gouge?" 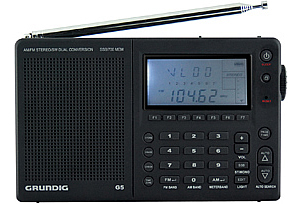 Best Uses: Unless you have a need for SSB, this radio will more than suffice in most any situation. A nice robust speaker is satisfactory outside and in. Good travel size. If it was the only radio in your bag, you would have plenty of radio to satisfy. Users have complained about the brevity of the manual; here is a copy of the expanded Tecsun manual. People were calling this radio a classic before I caught on, but now I know why. This is a venerable performer capable of great capture on all bands and nice room-filling sound. Yes, the G5 is an improvement, but if this is all the radio you could have, you wouldn't be disappointed. Pros: AM sensitivity reminds me of the old Delco car radios in GM cars, something at every frequency. Wide filtering is solid with 10kHz spacing. AM and FM audio is superb on speaker and headphones. SW can be muddy on certain stations. Loud enough for the beach, warm enough for inside. Very easy to use and scan for stations on AM & FM, SW more difficult with "chuffing" between frequencies. Direct frequency entry is a snap. Two clocks / 1 alarm (choice of music or buzzer). Time (24 hr) and signal meter are viewable when radio is on. Better than average battery life. Cons: Battery indicator comes on (and the radio shuts off) when it's time to replace them. Scrounging up 6 AA's on a moment's notice can be inconvenient. Some inconsistencies with AM reception (one model out of three was just average.) FM tunes up and down in increments of .05 MHz only. Only 40 memories, but you can use them for whichever band you wish. Dial light very weak - similar to a dirty fish tank. 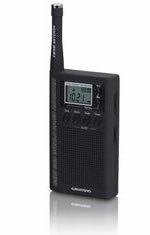 Best Uses: Outside or inside, this radio provides plenty of sound for the immediate area, depending on ambient noise. Excellent with headphones. Small enough for a suitcase, but somewhat large for an overnight bag or a back-pack. A great beach and boat radio, just don't try to stand it up on uneven surfaces. Personally, if I were limited to only one radio for an extended trip, this would probably be the one. 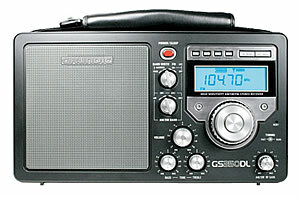 This is not the model I would recommend first to serious radio people, but it has become one of my personal favorites. So much so, I spent the price of a used one to have it fixed. 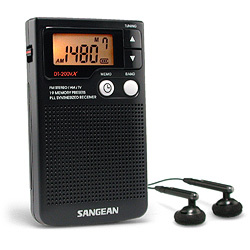 Vertical shape makes this a great radio to carry around in your hand. Light for travel and excellent battery life. Battery meter is good, signal meter is somewhat generous on the FM and SW bands, indicating a 5 on whatever comes in well. AM is weaker in rural areas and that's too bad. For me, this radio has the friendliest userface, especially when traveling. Pros: Well-built, 200 memories (with page to # of memory choices), 24/12 hour clock, nice dial, loud speaker (best for voice, especially on the SW band.) Very easy to dial scan, direct tune and the memory pages allow for easy recall. 120 minute sleep feature and wake-up to favorite station are favorites of mine. Choice of 24 or 12 hour clock. Japanese FM (86-108). Cons: The biggest flaw is that VHF signals will override the weaker FM signals if you're near an airport. (This drove me crazy on Cocoa Beach, FL - with Melbourne Airport a few miles to the south and the Kennedy Space Center to the north.) Speaker can be harsh on some over-processed FM music stations, otherwise loud enough for noisy environments. OK for headphones, but not as good as the G5, YB-400 and, surprisingly, the Mini 300. Best Uses: Small size works for beach, camping and weekend getaways. 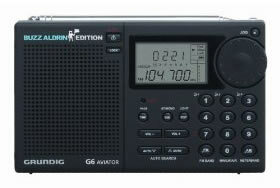 I like to use this radio when I want to scan signals quickly and see what comes in. For travel, you can easily set up specific memory pages for each area. This radio is always in the travel bag, whereas the YB-400 is not. In case you've misplaced yours, here is the System code function for this radio. If you're looking for a throw-back to the seventies, with 2000's technology, here's your radio. Big and bold and a very decent performer. But despite the digital dial, this is an analog radio. Beautiful sound - Max Grundig would approve. With a large antennas for MW/SW/FM, this radio is extremely sensitive. I haven't tested it for overload situations yet. Pros: The best sound of any portable - equal to the GE Superadio II. Very sensitive, I rarely have to extend the antenna. Huge, hearty whip antenna. Over-the-should carry strap. Easy to read, lighted dial. Runs on D or AA cells. (D's last forever). Style reminiscent of great AM/FM/SW receivers of the past. Cons: Size - it's very big for a portable. Tuning mechanism is a bit wobbly. Analog dial means no presets. No buzzer on alarm - so you can't listen to sleep, then wake up to louder volume. Fun to scan on SW, but I miss the presets for AM/FM tuning. Best Uses: Camping, beach house, deck or porch and during power-outages. Sitting at the table DXing, this radio is a great performer. I receive more emails on this radio than any other. Mostly because of its short run and the fact that for its small size, it performs better than you would expect. The perfect bedside travel portable, nice sound, but not loud enough for noisy environs. A superb pocket radio. Pros: Digital tuning and very sensitive for its size. Small, compact with a nice sound for the size of speaker. Fits in your shirt pocket, clock with alarm and sleep timer, stereo headphones. Cons: I'll venture to guess that manufacturer Sangean is behind the fact this takes AAA batteries that die fast without warning (I strongly recommend lithium or rechargeable batteries). Not conducive for outside and noisy environments, but a great late-night, bedside companion. Buttons seem flimsy. Not much amp wattage for decent headphones. Best Uses: My favorite "late night / bedside" radio hands down. Despite all the newer gear above, this still gets packed in the travel bag. Here is a copy of the manual for this radio. This was going to be the radio that would replace "all others" at the time. This is a very diminutive performer, loaded with features and decent sound. What keeps it from going into the suitcase anymore is battery consumption and a flimsy antenna. (The connection seems to weaken as you use it, causing drop-out. This is consistent over the three units I own.) Otherwise, it's performance rivals the best on this page. Pros: Great sensitivity and lots of features. 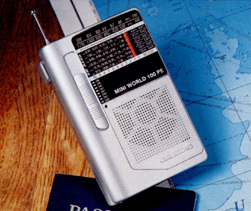 One of the first radios with the ATS system. Alarm with buzzer and "humane" system. (starts soft, get's louder as you try to ignore it) Decent sound from both speaker and headphones. Small and compact. Cons: Voracious battery consumption (a Sangean trademark) and a flimsy antenna connection. You'll hear crackle on FM and drop-outs on SW - the biggest reason this radio has been sitting at home. Very similar to the ICF-M300V, with most of the annoyances I found no longer there. It would seem that Sony is hell-bent on making their digital portables beep with every push of a button. (I wonder if this is a function of the beloved ICF-SW7600GR?) This radio has the best sounding speaker out of all, with one caveat - a weaker amp to speaker ratio. Pros: Really sweet sound from the speaker (the best for the size). Lightweight to carry around. Very sensitive on all bands. Stylish look, if you're into that. Cons: Amp isn't that strong, so you'll hit the distortion level early, more so on AM than FM. It's loud enough for personal use or a small room, but that's it. Mono earplug and no earpiece included. The AC adaptor (wall wart) is almost impossible to find. (Sony definitely has dropped the ball on these two issues.) No dial light and a funky twist knob to dial scan. No handle or carry case, but does fit in two hands easily. Only four presets for each band. Best Uses: Looking at the list of cons, you'd think I's rate this radio low. On the contrary, if you wanted a solid AM / FM performer, you would be very pleased with this radio. I like this radio best on Saturday nights when I'm jumping back and forth between three specialty shows. A major improvement over the 100, although the protruding antenna keeps this one from slipping into ANY size pocket. Better sound and sensitivity with the Grundig "rubberized" feel make this a superb go-bag inclusion. Pros: Speaker much easier on the ears than the 100. Decent reception. Clock and alarm work well for price point. Excellent amp and sound with decent headphones. (As good as any of the above.) Solid analog tuning with digital read-out. Sleep-timer and alarm. Plays forever on two AA batteries. Cons: Drifts on MW and SW. It will settle down after a while. Doesn't like cheap, store-brand batteries. For some reason I find the sound "fuzzier" unless I'm using Duracells or Energizers. Best Uses: Walking - on the beach, midtown Manhattan or around the block. Anywhere a larger radio won't do. Takes the place of the Mini 100, even though the antenna sticks out of my pocket! What makes this radio appealing is its size. 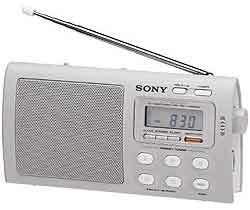 Slip it into any pocket and you have instant access to FM, AM and the major Short wave bands. When carrying a radio isn't feasible, you can practically roll this up in your tee shirt sleeve. Cons: Let's start with the biggie. A major design flaw is that when listening through the speaker on FM, you do not get left plus right monaural, you get right channel only. Fine for the Beach Boys, unacceptable for "Bohemian Rhapsody." I was finally able to use the tip of a ball point pen, clip off the tube, remove all remaining ink and stick it into the earphone jack where it will give me left plus right without muting the speaker. AM is very inconsistent unit to unit, but mostly poor compared with the similarly-sized 12-802 above. I bought and returned three until Eton sent me my current model (for the stereo problem they didn't believe true) and the AM wasn't as bad. Has a tendency to mute sound during nulls in FM signal (while moving the unit) instead of just letting the noise go through. The upgrade for the DT-200V makes a few improvements and adds one error in design. As I mentioned above, I prefer speaker use to headphones so I only use this radio on the LIRR when I can't listen through the speaker. A very strong performer that is perfect for many listening situations. Pros: Solid reception on all bands. Clock and lighted dial (see cons). Decent sounding headphones (sounds excellent on good headphones). Cons: Either the speaker comes from a 1970's Bell telephone or it's designed to sound that way. 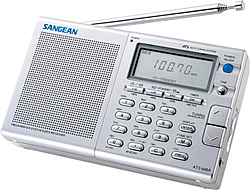 There's no alarm and the dial lights with every button push, adding to Sangean's propensity for building radios that love to drain batteries. The worst feature is the "Favorites" button that scans through a memory of 18 stations you select. Let's say you scan to a memory selection at 104.1 and want to hear what's up the dial at 104.9, you switch back to regular tuning and viola! The last station you had on was at 89.9 and you have to dial all the way back up. That's half the beauty of memory buttons; they bring you closer to other parts of the dial. Best Uses: On the LIRR. With electric trains wreaking havoc on AM signals, this little beauty will keep WFAN and the NY Mets in my headset well into Suffolk County. Not to mention when the game is on Channel 11, I can hear that as well. More? The G3 and G5 comparison here. back to jack jr. home page.